Cardboard is one of the most common-place materials we have around, and it’s estimated US consumers each recycle about 72 pounds of it annually. Paper and magazines waste is closer to 100 pounds per person. Fortunately, most of it goes back to making more cardboard and other paper products,with over 93% being reused. In technology, their is virtually no cardboard or paper used in the actual product. Typically, you would only find it in the shipping and packaging. But what if that could change? What if instead of metal, plastic and glass there was a way to use cardboard and paper? Here we look at some of the more innovative things that are being done with cardboard in our tech world. G oogle has brought new meaning to the word “cardboard”. Their $15 Virtual Reality (VR) headset that lets anyone experience VR with just a smart phone. By providing detailed manufacturing specifications to help promote the cardboard VR, Google has spawned hundreds of knock-offs and variations. These aren’t recommended for long term viewing, and they are decidedly on the lower-end for comfort. But they get the job done, and for a price that can’t be beat. Industrial designer Izhar Gafni decided to create a low cost bicycle. Starting out with recycled cardboard and some items in his garage, he was able to develop a fully-functional, adult bicycle. The cardboard bike weighs in at around 20 pounds, and can support nearly 250 pounds, with the material costs about $10. Find out more about this at Cardboard Technologies, which is bringing the bike to production (along with a cardboard wheelchair, cardboard toddler bike and other creative things with wheels). With funding from DARPA, San Francisco based company Otherlab has developed a cardboard drone capable of delivering a 1 Kg pound payload a distance of 150 kilometers (with an accuracy of about 10 meters). The entire unit isn’t made of cardboard – there is still the GPS electronics, the guidance motors and a battery. 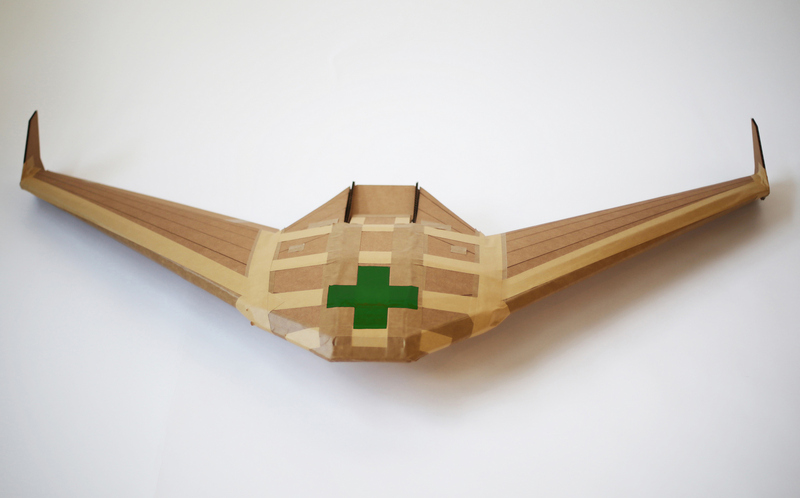 These disposable, cardboard drones with a 3-foot wingspan are intended for emergency food and medicine drops to remote locations, and for other single use activities. After a few weeks or months, the bio-degradable cardboard basically disintegrates leaving behind the small amount of hardware and battery. The zoom function on the IKEA KNÄPPA involves moving the camera – hah! Designed by Jesper Kouthoofd, the eco-friendly, recyclable camera is made out of one piece of folded cardboard which is secured by two plastic screws. A single circuit board holds all the electronics, camera sensor and integrated USB connector. There is a combined on/off and shutter button on the front – holding it down for a few seconds turns the KNÄPPA on or off and a “firm click” takes a photo. And not to be outdone, Pizza Hut had a promotion with a playable DJ pizza box, which connects via bluetooth to your Apple iPhone or iPad. We hope you enjoyed this fun look into the intersections of technology and cardboard. You can sign up for our weekly newsletter with just your email, and never miss any of our stories about tech, new products and interesting stories. For extra karma points, please use the Facebook, Twitter and LinkedIn buttons to share this with all your followers – family, friends and colleagues. Thank You!